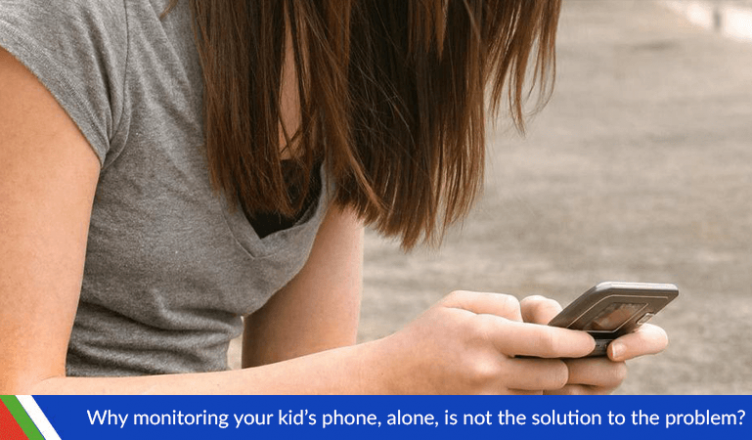 XNSPY Official Blog > Parental Monitoring > Why monitoring your kid’s phone, alone, is not the solution to the problem? In a study conducted by Pew Research Center, two-thirds of parents have expressed concern over the total amount of time teens spend, glued to their smartphones. With the variety of content available online, parents are increasingly becoming suspicious about their child’s online activity and feel forced to take action. The current market is bubbling with spying applications, allowing parents to monitor the online and offline activity of their children. XNSPY is a prime example of a monitoring application that offers a plethora of features such as location tracking, internet activity and calls log monitoring, geo-fencing, remote controlling of apps, and more. These apps ascertain what your child may be facing on a daily basis. You may not know about the bully at school who has made life hell for your child. Can you imagine what your child may be going through every day without you even knowing about it? Monitoring your child’s online activity may be one way of finding this out. While there is no doubt that it makes monitoring your children convenient but, is it really worth it? Misuse of these applications, on the part of parents, can cause more harm than good. Knowing every minor detail about your child’s life, including his friends, interests, hobbies, and whereabouts is not healthy for you. Furthermore, it deprives them of the freedom and the space to grow as an individual. Your kid doesn’t know that you’re spying on them and that too using an application that you discreetly installed on their phone. Would you go through all the hassle only to have your child mistrust you? It is your duty to be aware of your child’s activity, but being obsessive about it at the cost of losing your child’s trust is not the solution. While you can track online activity of your child on a smartphone, there are various factors that can’t simply monitor. If you want your child to act responsibly online, you should tell them so. Communication is the key to this. Have a discussion with them regarding the risks that they may face such as cyberbullying, online frauds and scams. Let them know what boundaries they have so that they are mature in their interactions with others online. Also, let them know the privilege they have and what you trust them with. And if you find them crossing the boundary line, let them also know the repercussions for it. Creating a supportive and understanding environment will nurture trust between you and your kid. Then, you will not feel the need to snoop behind their backs. What do teenagers say about their smartphone addiction? Contrary to popular belief, today’s teenagers are aware of the negative consequences of prolonged use of a smartphone. According to a study conducted by the Pew Research Center, 54% of US teens say that they are addicted to their phones. This heightened self-awareness regarding usage of smartphones has compelled teens to take action. Many, about 52% of teens, according to the study have done so by cutting down screen time. By assisting your teenager’s efforts to decrease screen time, you can help support your child. Gaining your child’s trust will help motivate them to reach out to you in case they find themselves in a sticky situation. And then you wouldn’t feel the need to constantly put your child’s activity under surveillance.